Sticking with my desire to enjoy simple, clean tastes and wanting to use some of my "leftovers" from last night’s shrimp sauté I decided to pull together a classic taste combination with a twist. First, I peeled half a dozen of the shrimp and cut them into bite-size pieces. Next I added some fresh squeezed lime juice, a bit of salt and some chopped cilantro. I let that sit while I worked on the final pieces. I had a perfectly ripe avocado hanging around so I cut it in half. The side with the pit remaining went into the fridge. I removed a bit more avocado from around the natural cavity left from the pit in the other half. I then took the half out of the skin in one piece. You can use one of those new fangled avocado tools, if you must, but a spoon will work just as well. I generally don’t even use a spoon, instead opting to carefully peel the skin off in pieces until I’m left with a beautiful avocado half. Now comes the twist. Many of the friends who attend my Holiday Party bring me nice thank-you gifts. It’s very sweet of them! One gift I received this year was a bottle of Deerfield Ranch wine and a bottle of their Ginger Lemongrass Grapeseed Oil. Besides the fact that we are learning about all the health benefits of grapeseed oil, it has a wonderful sort of nutty flavor to it. Add the ginger and lemongrass flavors and you have an exotic blend of flavors complimentary to many food preparations. Since the shrimp had been sautéed in oil I had to be a little careful how much I used (you know next time I might actually sauté them in this oil!) but I tossed the shrimp mixture with a teaspoon or two and drizzled a little right on the avocado. 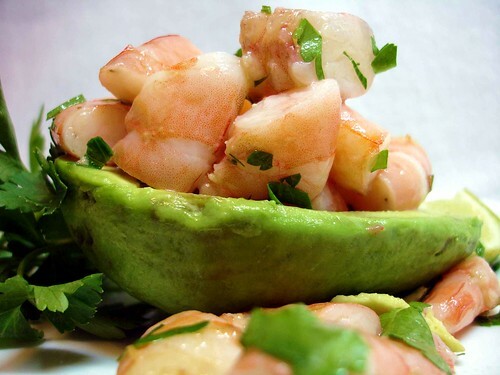 Next I placed the shrimp in the avocado cavity mounding it high, spruced up the plate with a little additional cilantro and a couple slices of lime and lunch was ready!